A tiny snail longs to see the world and hitches a ride on a whale’s tail. Together the snail and the whale go on an incredible adventure, seeing all sorts of amazing sights. But when the whale becomes beached in the bay, it’s up to snail to save the day. The Snail and the Whale is a heartwarming story that illustrates that anyone, no matter how small they are, can achieve great things if they put their mind to it. Julia Donaldson’s playful use of rhyme, repetition and onomatopoeia make this a fun book to read aloud. The rich and sophisticated language throughout means there are plenty of language goals to target. The use of adjectives and descriptive language is brilliant. I love phrases such as “shimmering ice” and “stripy fish with feathery fins”. 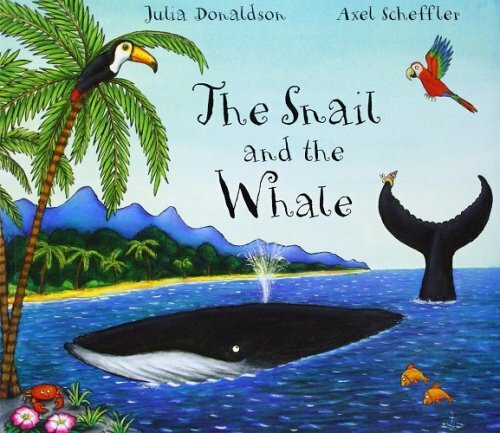 The Snail and the Whale is packed full of words containing /s/ blends and words ending in /l/, so also a fantastic choice for little ones working on these sounds. For further speech and language targets in The Snail and the Whale, see the list below.